Stop asking "What branch am I on...?" 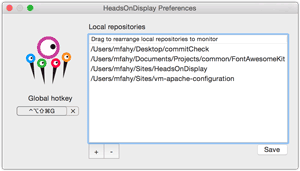 Heads on Display provides the answer at a glance — for all your local git repositories! Click the image above to watch a brief introduction by the creator on YouTube. It's amazing how much time developers spend just making sure they're working on the right branch of the version-control repository. A quick Web search for "show git head" or "show current branch" reveals tens of millions of search results — a testament to how often the question comes up. 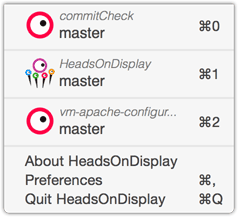 Heads On Display puts an end to not knowing by showing you exactly what branch you're on, exactly when you need to know. Finally, your workspace includes a "You are here" marker. A simple idea, beautifully implemented. Heads On Display shows the repo of your choice on the status bar at all times, and provides instant access to your other tracked repos with a single click. New repos can be added and reorganized using the Heads On Display preference panel, or simply dragged to the status menu item for instant display. 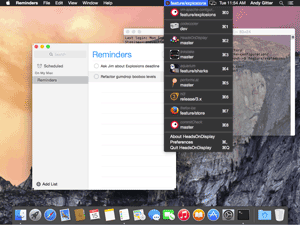 Heads On Display lives in your menu bar, and looks great with both the traditional Mac menu (Light) theme and Yosemite's new Dark theme. How'd you ever live without it? Easy to set up, easy to use, Heads On Display quickly becomes an indispensable part of your workflow. Heads on Display remains visible across applications. Whether you're working within an IDE, image editor or the terminal itself, your current branch is available at a glance. In addition to providing immediate branch visibility, Heads On Display also gives you quick access to your local repositories. A single click opens your project folder. Heads On Display responds immediately when your repo's current branch (HEAD) changes — regardless of what or who initiates the switch. Are you a visual person? 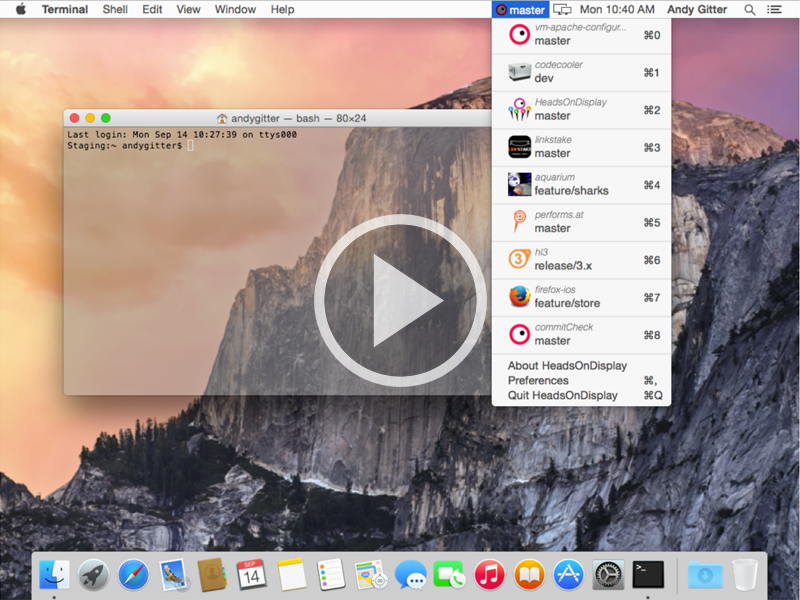 Assign icons to each repo to make them instantly recognizable in your Mac menu bar. Add the icon to the repo itself to share with other team members, too! A quick look at system resources will assure you that Heads On Display handles its business as efficiently as possible while you go on about yours. It uses minimal resources to provide maximum convenience. Even die-hard git users will appreciate the ease of use and "warm fuzzy" feelings that come from having your git branches under control 24/7.